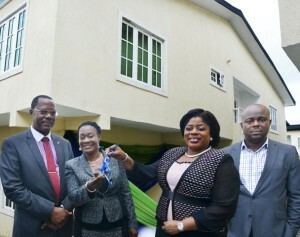 Fidelity Bank Plc, one of Nigeria’s top banks in terms of capital adequacy ratio (CAR) has handed over the keys and title deeds of a gorgeous 4-bedroom duplex to Mrs. Clara Ego Ibedu, who emerged star prize winner in the sixth draw of the Save 4 Shelter Savings promo. Built with a stylish and tranquil penthouse, the duplex, located in Lekki Peninsula, Africa’s fastest growing corridor, is truly an architectural masterpiece. With this recent development, Ibedu has become the second woman after Hajia Hadiza Suleiman in Abuja to win the first of three magnificent promotion houses. The other superbly furnished edifice in the garden city of Port Harcourt was won by Edozen Adodo, an apprentice in his mid-30s. It was indeed a moment of unbridled joy and excitement as lucky customers carted away cash and fabulous consolation prizes at an elaborate presentation ceremony held in Lagos. Christopher Oluwaseun smiled home with a cheque of N2 million while Godwin Obiora and Kazeem Fatai were presented with a cheque of N500, 000 and a Refrigerator respectively. Also, a toddler, Angela Oluwanifemi Apoesho was indeed, the cynosure of all eyes as the two year old received a brand new Thermocool generating set from the Bank. Similar prize presentations held concurrently across the different regions of the Bank. Speaking at the occasion, Managing Director/Chief Executive Officer, Fidelity Bank Plc, Nnamdi Okonkwo said that the promo is strategically designed to advance the financial inclusion mandates of the federal government. Okonkwo, who was represented by the Executive Director, Lagos and South-west, Fidelity Bank, Mrs. Nneka Onyeali-Ikpe said the rationale behind the promo was simply to help reduce Nigeria’s housing deficit. “Of course there is a huge housing gap in Nigeria. The idea is that people should save to be able to own their homes which supports the federal government’s housing policy,” he said. More than 200 winners emerged throughout the six months duration of the promo which was open to all Savings Account holders of the bank. Three duplexes in prime locations in Lagos, Port Harcourt and Abuja were won at the bi-monthly draws, while a total of N35 million rent support was won at monthly draws at an average of N5.5 million per month.